I find that the more I read the writings of C. S. Lewis, the more I find myself admiring his skill as a writer and thinker. I do not know of another writer who is so good at getting straight to the heart of whatever subject he is considering and working out every logical implication of a position held by himself or someone else. 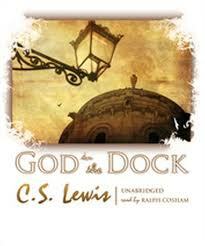 Thus, I found this collection of essays by Lewis titled God in the Dock to be a special treat. These forty-eight essays written over a period of some twenty years and published in a variety of publications provide excellent examples of Lewis’s clear thinking and uncompromising defense of his Christian beliefs. Although there is some diversity of subject in these writings, the editor, Walter Hooper, has sorted them out into three parts and included a fourth part containing a few letters Lewis wrote. As he explains, the first two parts deal mostly with theology while the third has essays dealing more with Christian ethics or behavior. These essays are not so easily differentiated and Lewis is always as much concerned with Christian living as much as Christian beliefs. Ethics and theology blend together more than are separated in these essays. Lewis does tackle a variety of subjects in these essays, but always he returns to the same themes. He defends the concept of miracles against the idea that science disproves the miraculous by pointing out that science only studies the regularities found in nature. Given that the miraculous is not part of the regularities, science can tell us nothing about it. Lewis also argues against reducing everything to mechanistic naturalism. He insists that to study a thing is not the same as to experience it and one must not assume that either process tells us everything about the thing. A person in love experiences the emotion of love. A doctor studying his brain might perhaps learn something of the chemicals that produce the feelings of being in love, but cannot know what it is to be in love unless he actually experiences it. C. S. Lewis defends dogma in religion against those who would do away with it in favor of a loose theism by pointing out that a religion with no beliefs is hardly worth the trouble. He writes of the difficulties of spreading the Christian message to a contemporary audience and of the necessity of speaking the common people’s language in order to teach them. The essay God in the Dock notes that unlike the pagans in first century Rome, most people today do not believe themselves to be sinners in need of repentance and instead of fearing the judgment of God, is more inclined to put God in the dock and judge Him. One of the themes throughout C. S. Lewis’s writings is his contention that it is what is true that matters, not what is modern or progressive or practical. In Bulverism, he attacks the twentieth century fashion of refuting an argument not by proving it is wrong, but by attacking the motives of the debater. (Check your privilege?) He insists that a point is either right or wrong, regardless of the motives of the person stating it, and it can only be shown to be right or wrong using reason. There is a lot more to this collection and I have only scratched a very shallow line on the surface of the profound riches to be found in reading these essays. I think that any follower of C. S. Lewis will find that reading God in the Dock to be a rewarding experience.